So, you want to find a real data entry job from home and you’re wondering if any actually exist? Great question. The short answer is yes. But the long answer is a little more worrying. I did manage to find 14 companies that are currently looking for remote workers to do data entry. These companies do not charge a fee to apply for these jobs. Pay is either per piece or per hour. When I hear the words data entry, I instantly think scam. That is because there are a lot of data entry jobs that are mislabeled in order to deceive you of money. This is nothing new. In fact, we blog about it on a weekly basis. Amidst the muck and grime lay a few legitimate companies offering online data entry jobs. Now, before you think you’ve struck gold with this post, realize you haven’t. These jobs are highly competitive. More often than not, you’ll be put on a waiting list for 6-12 months just to be told you don’t meet the job requirements. Even if you do get hired, you’ll be working for minimal wage, if not less. Listen to me, data entry jobs ARE NOT going to make you rich. This may sound harsh, but it is the truth. Data entry jobs just aren’t skilled positions and the competition for them is fierce. Why would a company hire a US based worker for $10-$12 per hour when they could outsource it for under $2. For every American, they can hire 5 equally skilled workers overseas. Typically, you’ll find data entry work as part of a responsibility of a larger position, most notably, a virtual assistant job. My advice, seek out better paying work from home jobs or something like a work from home chat job. There will be less headache and less hassle. Transcription jobs are more specialized and require a bit more skill and strong grasp of the English language. Therefore, they pay better and companies are constantly on the look out for new employees. If you’re still interested in doing data entry work, the following list would be a good place to start. I’ve scoured the Internet and found 14 opportunities for you to land a data entry job from home. This industry has been notoriously plagued with scams. A GREAT paying job will net you around $10-15/hour. Remember: anyone promising you higher than $15/hour is likely trying to rip you off. If you receive such a job offer, please leave a comment below this post with the job posting and company and I will happily look into it for you to make sure you applying for a real job. This Canadian company offers work-at-home jobs in transcription and stenography across the USA, U.K., and Canada. It will also offer work in different departments to those contractors who have a good track record with the company and who have additional competencies such as knowledge of legal/medical terminology. A typing speed of 70 wpm is required. The basic transcription pay rate is $0.004-$0.0055/word, or $0.40 per audio minute. This Pennsylvania-based company offers data entry work including Internet research, address correction and verification, and document scanning. Axion applicants must have a working computer with high-speed Internet access; they must also pass a criminal background check. Work hours will span 20-25 hours/week and payment is per completed piece. Depending on your speed and expertise level, you could earn $5-$19/hour for your work. Axion hires regularly; however, you must submit your name into their database in order to be eligible to work for them. With that comes a charge ranging from $5-$10, depending on how long you want your name to stay in their database. This company offers various services, including transcription, bookkeeping, project management, copywriting, translation, and data entry. Capital Typing also operates a call center. Payment is either by audio hour or per word. 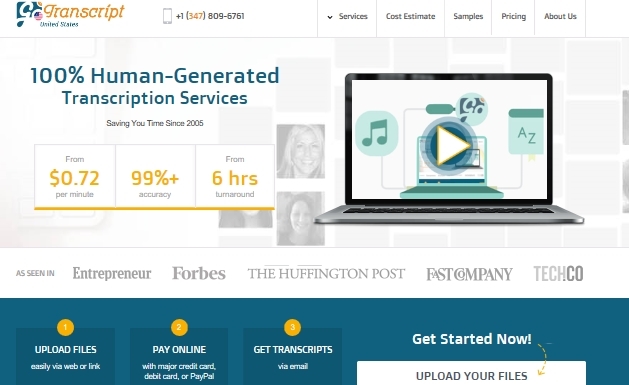 This site hires workers for both data transcription and data entry jobs. Hired freelancers typically earn $9-$10 per hour. To start looking through the site’s posted jobs, you will need to fill out an online application, after which your email will be verified. Click Worker will then send you periodic notices of job opportunities via email, but you can search its online job board too. Dion hires individuals to do data entry from home. Potential workers must first fill out an independent contractor application, after which they are sent notifications of new jobs. Job prerequisites include a typing speed of at least 60wmp, basic computer skills, and Internet access. Payment is per finished piece. This 11-year-old company that is based in the U.K. offers data entry jobs in transcription and video captioning across the world. If your online application is accepted, you undergo training and certification before being allowed to accept client work. Payment is 72 cents per audio/video minute. They hire regularly and allow you to choose which projects you would like to work on and complete. This company hires independent contractors to perform both basic and specialty (e.g., legal, medical, law enforcement) transcription work. Transcription services are offered in several languages (e.g., English, French, Spanish), so knowledge of extra languages is a plus. Part of the application will include a background check ($15 fee paid by contractor) as well as signing a HIPAA Business Associate Agreement. 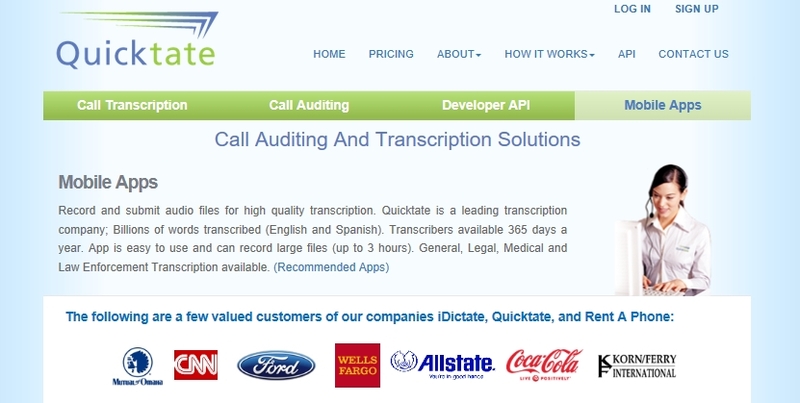 This company hires independent contractors for data entry and transcription work. Typical tasks include uoloading files such as podcasts, webinars, and regular phone calls. Once a job is selected, it must be completed within two hours. Scribie jobs are evaluated for completeness and assigned a 1 through 5 point score. The pay is about $10/hour. Lionbridge SmartCrowd (previously Virtual Bee, previously Key For Cash) has been in business since 2001. They use crowdsourcing to offer data entry jobs to individuals living in the USA and abroad. To become a contractor with Lionbridge SmartCrowd, you will first need to pass an evaluation. Part of this evaluation involves having a fast typing speed (60+ wpm); however, if you don’t pass the evaluation the first time around, you can always test again. The company offers a pay rate of $0.30 per 1,000 keystrokes, and this pay rate increases with increasing experience and time on the site. Lionbridge is one of the oldest and most trusted names in data entry jobs. This company is better known for their call center services; however, they also offer occasional data entry jobs. You can indicate your interest in data entry work within the online application after joining the site’s online community. A job board is also posted at this site, which you can peruse anytime. Also, knowledge of extra languages such as French or Spanish is a big plus here. The pay rate with Working Solutions ranges from $7.50 to as high as $30/hour depending on the skill level required. Sigtrack collects US based data entry freelancers and combines them into a pool of workers to help distribute data entry work evenly. They conduct Skype interviews after you apply and you must prove your residency. The work focuses around matching the signatures of registered voters into voter databases, thus the reason behind only accepting US-based applicants. Pay depends on the amount of work you complete and is then paid out via PayPal. Xerox has an entire work at home jobs division. They regularly hire for tons of positions including: Customer Care, Tech Support, Data Entry/Verification, Image Tagging, Quality Control, Systems Development, Software Programming, & Administrative/Business Support. Check the available positions often because data entry jobs can pop up at any time. TDEC is in constant need of data entry operators. The jobs aren’t advertised on their side, but they request that email in an application and a resume. They will get back to you with job positions as they open up. I’m including this one on the list because it is definitely a remote data entry position. The downside is that you do need to attend on-site training in Missouri or Ohio. Once you complete your training, the rest of the job can be performed remotely. I hope this list provided you with some valuable insight into real data entry jobs. Unfortunately, it’s fairly basic work that doesn’t pay that well and the jobs are hard to find. I would highly suggest looking at our complete work at home jobs list as there is likely something in there that will be a better fit and offer you a bit more money. Have you worked in data entry with any one of the above mentioned companies? Please leave a comment below about your work experiences. Do you know any one who could would find this list useful? Please give us a share! Hi Steve, I have actually been thinking about getting into Data Entry lately as I have just recently quit my job, and am leaning of looking towards a different industry to get involved in. 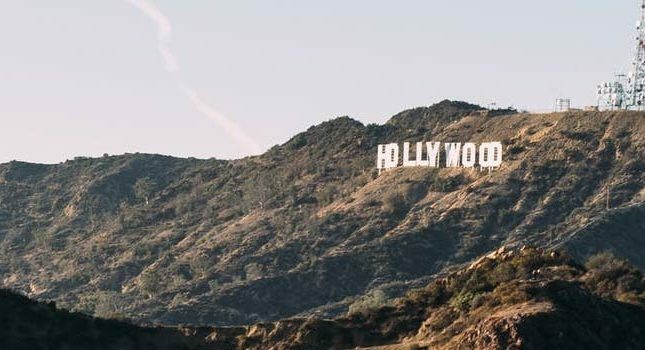 Thank you for the informative article, I will be thoroughly researching these companies that you have listed, hoping I can make some extra income here! Thank you so much for this list it is really handy and definitely on time. I recently applied to Fancy Hands Corporation in order to do some virtual assistant work. For some reason they did not hire me and I know that I am pretty good. But I’m so glad to see that there are alternatives to this program. And other ways that I can actually make money from home with data entry I do appreciate this information that you took time together. And I will be returning to read more from you. Thanks. 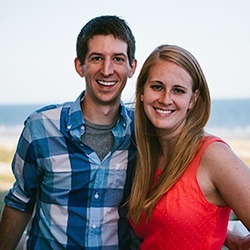 Hi Steve, A great article that puts some faith back into the data entry market. Unfortunately, it does not apply to international applicants. This is unfortunate as it leaves the door open to the scammers to scam all the international applicants. Bottom line, if you don’t live in the US, Canada or UK, don’t waste your time, and probably your money. Steve this is great information! I absolutely needed this 8 years ago when every time I searched for data entry jobs I got bombarded with fake “make money in your pajama” ads. I personally like where you break down the $13/hr for Sound Hound and explain how you pretty much have to be near perfect to do it. GoTranscript probably would have been my top choice back then because I can absolutely see myself doing that right now just on the side. Again, GREAT information! I actually didn’t think remote data entry jobs were real until I stumbled across this page. You’re very welcome Jaron! I published this list to try and combat the garbage that is out there masquerading as data entry jobs. Plus, I wanted to give my readers an actual resource to find real data entry jobs as well. Thanks for posting this list, Steve. I’m glad to see that there are so many data entry jobs that are legitimate and don’t require an upfront fee just to apply. That actually seems ridiculous to me – paying just to apply for a job. I do think the best option for making money online is to start your own online business, but if someone needs money during the start-up phase, data transcription might be just the ticket. There were so many scams running around claiming to be real data entry jobs a few years back. The “data entry” was you inputting your credit card number to buy ads. Hardly a job at all! This is great and informative. I did not know that there was so lot of chances that offer legit and real data entry jobs. How many workers are on those companies? Do you need to pay for to join or is it absolutely free? I just read your article “12 Companies that Offer Real Data Entry Jobs”. I just wanted to say what a great post this is, you have provided a ton of info here. i am always looking for a way to better myself and my financial situation and you have helped to open my eyes a little here with your article. I am going to save your site so i can check out more of your article! thanks for all the great info and Cheers! First time to visit your site and I’m glad I found it. 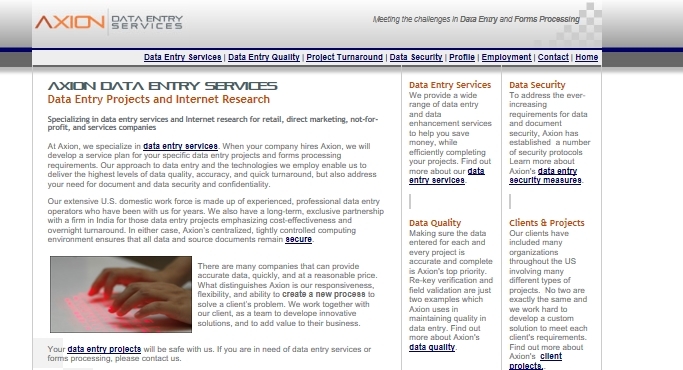 Thanks for sharing this great article about real data entry companies. It sounds quite interesting as a part time job, as I live in an agricultural area in South Quebec, most of the jobs in my area are related to work on farm and fields, which is not too “nice” or “perfect” for me. I will keep this article on my favorites. 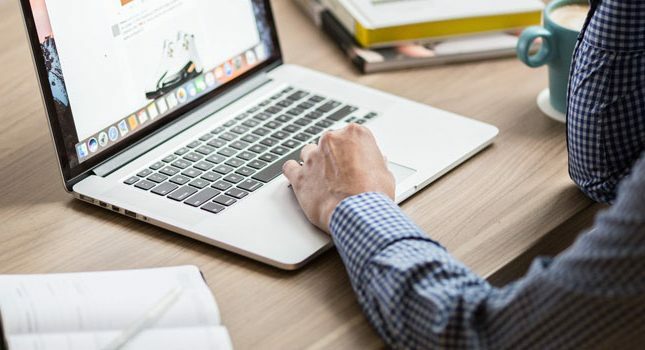 Thanks for sharing this post, there are many companies out there that offer Data entry but most of them are scams, it`s great to know there are still companies out there that will pay for Data Entry work. Having said that, I feel anyone looking to make real money from home will do much better doing other things than Data Entry but then, it`s a good place to start especially for those who do not have money to invest. Now $5 per hour is really low, I know this is money from the comfort of your home but you will need to work really non-stop to earn anything to talk of. Will have to check working solutions, I speak German(that`s why my English is terrible) who knows, I may be able to find those $30 per hour jobs. Thanks, Steve, very informative just have one question, are you sure these companies pay? with the many scams out there, it`s hard knowing what site to trust. I see that most (if not all) of these programs apply only to US, Canada, and UK residents. Which makes me ineligible to join. Are you aware of any Data Entry Jobs companies that accept applications from around the world? Not at the moment unfortunately. You can check Amazon’s mechanical turk section, but those jobs are so low paying that it’s rare to find one that is worth your time. I did not realize there were that many work at home data entry opportunities to choose from. It is nice to have different options to consider. I appreciate the comparison details regarding pay and requirements, and know some people wanting to work from home. This may be something they can do. Thank you. Glad to have been able to help Bert! Real, legitimate data entry jobs are hard to come by. Hopefully the research here will help people get moving in the correct direction. 70 wpm is doable for me but I am still a little skeptical on legit data entry jobs since it is a low-skilled typing job that can be done by almost anyone which makes it attractive to scammers that pressure people into subscribing. I recognize several companies on here including Scribie, Dion Data solutions, Clickworker, and Birch Creek. Are these ranked in a particular order? Really helpful info. I might end up trying some of these myself. Been looking around for some data entry work. Thanks for posting!